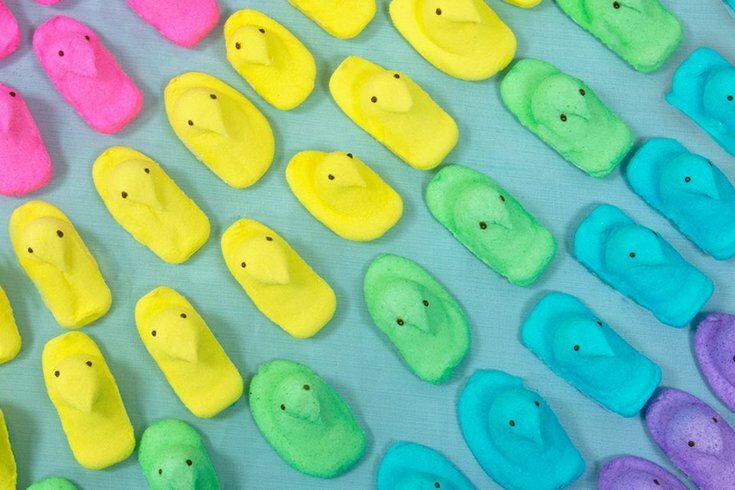 Peeps, the marshmallow candy most often consumed during Easter, are made in Bethlehem, Pa. Beginning Monday, April 1, 2019, Dunkin' will selling Peeps-themed doughnuts and Peeps-flavored coffee. Peeps, the Bethlehem, Pennsylvania-made marshmallows with a taste and texture as contentious as candy corn, is the new flavor of Dunkin' (just Dunkin') this spring. The doughnut-and-coffee chain announced its new Peeps-themed lineup, just in time for the spring season, earlier this week, with treats officially available starting Monday, April 1. Among the seasonal items are a Peeps-flavored doughnut, finished with white icing and egg-shaped sprinkles, along with green sprinkles that look like that plastic grass you get in Easter baskets. Fastened on top is a yellow Peep, not protected in plastic wrap. The theme continues with Peeps Marshmallow Flavored Coffee, available in hot or iced coffee form, as well as frozen coffee or frozen hot chocolate. The journey doesn't stop there, however. In conjunction with Peeps' hometown in Bethlehem, Dunkin' will be driving a so-called Peepsmobile around the Northeast, traveling from Bethlehem to Quincy, Massachusetts, to bring these marshmallow-flavored goods to all. The Peepsmobile will be on the move from April 2 to April 4 and, much like the Peeps-flavored doughnut, has a yellow Peep on top. You can follow the Peepsmobile's journey on Instagram and, if you're in the first 250 people to swarm the car at any of its stops, you'll get some free Peeps treats, if you're into that.